Due to use of Flash memory there are no moving parts in SSD. This reduces the physical damaging of an SSD. There is no head to seek a particular location of the disk, thereby reducing seek time and increasing speed. As there are no spinning parts, the amount of electricity required, to spin the platter of hard drive is zero, saving electricity. It also occupies less space as compared to hard-disk, making it more ideal for usage in portable devices like laptops. Apple is considering using a SSD for their MacBook Air. Using SSD technology, a large amount of storage can be crammed into a small space. Recently Samsung launched its 2.5 inch 256 GB SSD which is 9.5 mm thick, and measures 100.3 mm x 69.85 mm. It offers a sequential read speed of 200 MB/s and sequential write speed of 160 MB/s, Samsung’s 256 GB SSD is claimed to be about 2.4 times faster than a standard Hard drive. Samsung is expected to launch a 1.8 inch 256 GB SSD by the end of fourth quarter. Samsung claims that the its SSD uses only 0.9 watts in active mode. 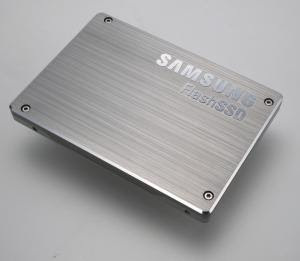 Samsung has also launched a 64 GB SSD, with speeds quite than the 256 GB version. But above all these advantages, the price of SSD is the factor, that keeps it away from our reach. They are expected cost nearly $1000 as the technology is in early stages of development, once they get mainstream, they will cost as much as regular Hard Disk Drive. But as of now, considering all facts, the Hybrid Hard Drive if the best option of enthusiasts, unless you have a lot of money to splurge on a SSD. Hybrid Hard Drive (HHD) is a combination of the Hard Disk Drive (HDD) with a large amount of non-volatile flash memory (called as buffer memory). Its just like a Hybrid Car that can run on both batteries as well as fossil fuel as and when required for greater efficiency. The flash memory in a HHD starts at a minimum of 128 MB. HHD with 256 MB buffer capacity have been developed. A prototype of HHD with 1GB buffer has also been developed. The buffer memory of HDD ranges between 2 – 16 GB. HDD with 32 MB buffer have been developed though. Hybrid Hard Drive definitely offers better performance and lower power consumption as compared to any other HDD. Because they make use of Flash memory the data that is frequently used is stored in the Flash memory of the HHD. This reduces the time required to fetch data from the particular area of the disk. Also as Flash memory has no moving parts, the possibility of reducing the life of your hard drive due to long uses is greatly reduced. Hard Drive usage apart from reducing power consumption, increasing life of your hard disk, reduce also the boot-up time your computer, by caching the data required by computer for next boot-up. The most significant increase in speed will be while resuming from hibernation mode. The data to resume from from hibernation mode will be stored into the buffer memory of HHD, and due to high speed of Flash Memory, it will be loaded very fast in the RAM. The difference of resuming from ‘Standby’ and ‘Hibernation’ mode may vanish, thereby making Operating System manufacturers completely do away with standby mode, and use only hibernation mode. From the point of view of prices, Hybrid Hard Disk is definitely going to cost more than the Hard Disk Drive of same capacity. But thinking of all the advantages they offer over HDD, they are definitely worth it. Also Solid State Drive, which are much superior than either of these are very expensive. Using a Hybrid Hard Drive, will definitely be a much greener alternative to the Hard Disk Drive.